We’d love your help. Let us know what’s wrong with this preview of Frostfire by Jamie Smith. On Choosing Day, children of Adranna who reach the age of fourteen are finally eligible to undergo the tests to determine if they are worthy of bonding a Frostsliver. Only one in a hundred are destined to succeed. If chosen, they will have to climb to the top of the glacier and cut a piece off for themselves, so that they may be granted the powers they've always dreamed of. To ask other readers questions about Frostfire, please sign up. I picked this up hoping for a well-written wintry read for the Christmas period, and having just got back from a trip to Iceland and wishing I was still back in the land of ice and fire, Frostfire didnt disappoint on that score. Not only did it whisk me away to an epically icy mountain with all the descriptions of glaciers, blizzards and remote caves (and ash) that I could want; there was also a well-contructed fantasy world, characters that felt authentic and an insightful struggle about what is I picked this up hoping for a well-written wintry read for the Christmas period, and having just got back from a trip to Iceland and wishing I was still back in the land of ice and fire, Frostfire didnt disappoint on that score. Not only did it whisk me away to an epically icy mountain with all the descriptions of glaciers, blizzards and remote caves (and ash) that I could want; there was also a well-contructed fantasy world, characters that felt authentic and an insightful struggle about what is good and what is evil. I can't say I've ever read anything like this before. I cant compare it to anything, it felt very original to me. 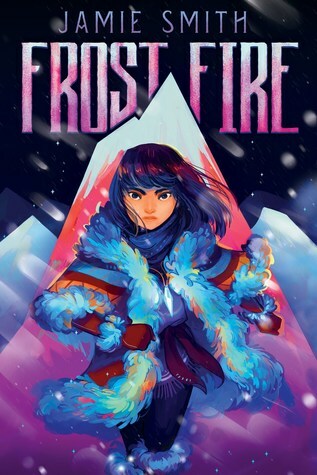 The overdone teenage fantasy elements I braced for dont exist in Frostfire, and the imagination of the author is clear, even in such a succinct book by todays standards of fantasy writing. On a personal and kind of strange note, I'm really put off a book when names of characters/places/creatures are uninspired or on-the-nose, but the names in Frostfire are spot on! Not too obvious, not too outlandish. I genuinely have no criticisms for this book, congratulations Jamie Smith on a wonderful debut novel! I read a library copy of this, but will be purchasing one for myself in the near future. A solid if not standout 9-12 fantasy adventure. The market is absolutely swamped at the moment with this kind of stuff but while Frostfire feels very familiar in many ways, it does feel fresh is in its plot and arc of action. Rather than the usual road-trip quest, rote gains-and-reversals stuff, Frostfire plunges Sabira first into a pretty gripping survival story. She encounters only ever-increasing obstacles and has to make her own luck. Smith handles the ratcheting peril extremely well, and nev A solid if not standout 9-12 fantasy adventure. The market is absolutely swamped at the moment with this kind of stuff but while Frostfire feels very familiar in many ways, it does feel fresh is in its plot and arc of action. Rather than the usual road-trip quest, rote gains-and-reversals stuff, Frostfire plunges Sabira first into a pretty gripping survival story. She encounters only ever-increasing obstacles and has to make her own luck. Smith handles the ratcheting peril extremely well, and never gives Sabira an easy out. He writes her with a good balance of applicable life-experience and knowledge that equip her for some of the challenges, and solutions and knowledge she must figure out anew. I love that Sabira has to solve all her own myriad and mounting problems, and that the stakes are so high - if she puts a foot wrong, she will die. The only thing that lets this down is that the parameters of the Frostsliver device are vague. Its capacity to help Sabira is a little too vaguely defined. Crucially, it's not clear to what extent she is protected from exposure by the frostsliver, muddying the stakes of one of the greatest potential perils. But other than a few points that could have improved to even greater effect, that aspect of the novel is its greatest strength. The bigger letdown is that there's a whole half of the plot that feels superfluous. I think the book would have been better for cutting the whole impending war/invasion plot entirely. It's vaguely drawn and concluded with much less flair than any of the survival stuff. The structure is a bit of a problem too. I wonder if there's a particular edict from publishers, or advice from a popular writing course, right now that children's fantasy books must have a (excuse the pun) cold open? As if without an in-media-res bit to start that promises that stuff is going to Get Real, kiddies won't be interested? Here the opening is intriguing but is followed by a lengthy recap of the backstory, which is utterly undermined by having all its stakes and outcomes pre-established. This is backstory that could easily have been told alongside the present-time, up-the-mountain narrative. Regarding structure, the decision to use 'parts' in the book is also rather silly and actually works against the core strength of the book. This is a single, simple story (even with the superfluous invasion plotline), not an epic with time-skips and min-arcs. Relationships and secondary characters are also a weak point, but are adequate to the tail. The central relationship between Sabira and her 'frostsliver' (a kind of spirit-guide helper of the sort we've seen a lot since His Dark Materials) is decent if not as compelling as it could have been. There's rather more angles to the frostsliver device/relationship in general, and Sabira's version of it in particular, than the author is really able to deal with in this narrative. As mentioned above, this has the odd practical impact on the tension as it rests on parameters that feel vague rather than mysterious. There is also little time devoted to what in theory ought to be a huge psychological impact of the new relationship. The important sibling relationship, though of the deeply idealised sort which are very popular right now, is fairly touching, and while the other familial and mentor relationships could have done with more attention, they just about serve. This story creates a frozen perilous world where Sabira fights for her life. I loved the icy mountain and the myths around the glacier where she must claim her frostsliver. But the ice is not simply a backdrop to an exciting adventure. Colonel Yupin's bitterness is rooted in resentment and envy of her land of ice - for his own world is smothered in ash. Sabira has to race to save her village from his plans to destroy it. Her love for her home is easy to understand because we meet so many warm an This story creates a frozen perilous world where Sabira fights for her life. I loved the icy mountain and the myths around the glacier where she must claim her frostsliver. But the ice is not simply a backdrop to an exciting adventure. Colonel Yupin's bitterness is rooted in resentment and envy of her land of ice - for his own world is smothered in ash. Sabira has to race to save her village from his plans to destroy it. Her love for her home is easy to understand because we meet so many warm and interesting characters from it. (Although my favourite character of all was Danlin, the soldier from the ash lands who hates the Colonel as much as Sabira does.) The sad sub-plot involving her brother added another dimension to the mythology of the mountain. Then there were the intriguing ash-cats, mentioned but not significant. Yet. This review has been hidden because it contains spoilers. To view it, click here. An exciting and unusual fantasy book for Teens . Sabira has been chosen to bond with a Frost Sliver . A piece of the living glacier which is near to her frozen home . Frost Slivers are part of the giant glacier and are sentient beings . If she succeeds in cutting one from the glacier it will become one with Sabira , sharing it's wisdom and help with her . She starts off on her dangerous pilgrimage to the top of the mountain.Trapped by a huge avalanche Sabira must find another way home . She must g An exciting and unusual fantasy book for Teens . This was a really fun and adventurous polar fantasy story. The characters were interesting and I especially loved the sentience of the Frostsliver, getting to know that personality was particularly interesting to me. I thought the main character was really likeable and I was rooting for her. I enjoyed the reveal mid-way through the book too and thought that added a really compelling aspect to it. A strong 4 stars from me. A really nice story, easy to read and understand. There were so many emotions in just a few pages. Even though it was a simple story, the way the bonds were created (based on the life of characters), made me love the book. This was an enjoyable short read and I just can't get enough of the cover. I just didn't like some smallish aspects (one of them has been resolved, yay)....like....the whole sideplot which became the mainplot and was...unexpectedly violent ^^'? J H B Smith is a writer of fantasy and sci-fi fiction novels for any ages willing to read them. Between working as a software developer and dealing with the whims of capricious, sporadically violent tiny monsters (i.e. cats), he has written more books than he strictly should have and is continually working on more – there are always more stories on the Infinite Sea. His children’s fantasy Scaled was J H B Smith is a writer of fantasy and sci-fi fiction novels for any ages willing to read them. His children’s fantasy Scaled was a Runner Up for the Bloomsbury/National Literacy Trust New Children’s Author Prize 2015. His children’s fantasy Frostfire was Shortlisted for the Times/Chicken House Children’s Fiction Competition 2016 and will be published by Chicken House in 2018.